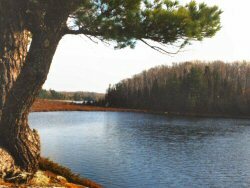 How about a trip that takes you on a quiet lake where you can set up a camp and just do some fishing and wildlife watching. Craig Lake State Park in Michigan's Upper Peninsula is just such a place. Secluded, Pristine, Beautiful, Quiet and Alone. Alone you'll be, but you'll have guests. Loons, Eagles, Deer, Moose, Otters, Beavers. We've got the Old Town Canoes or Kayaks, fishing equipment, and some camping equipment. Stay a couple of days or a week. Camp sites are a first come basis but then you can also just make your own.